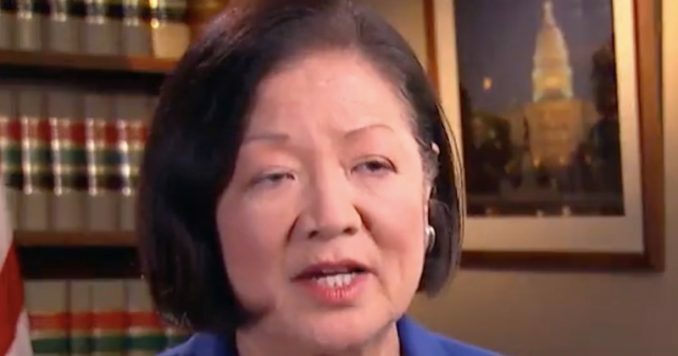 Hawaii Senator Mazie Hirono just admitted what Democrats really think of voters. As she propped up her own party for being so smart, she insulted most Americans. She says there’s a reason they can’t seem to connect with us, but the problem isn’t them. It’s us, and it’s enough to make your blood boil. Don’t miss this. Democrats cite a variety of reasons why they can’t connect with the working and middle-class voters in “flyover states.” The prevailing theory, made famous by 2-time loser Hillary Clinton, is that these mostly white voters are simply too racist to vote for a white candidate. Fox News reports that Hirono recently spoke at a conference in Washington, D.C., where the moderator asked her how the Democrats could drive voter turnout and connect with them in a meaningful way. “I wish I had the answer to that because one of the things that we, Democrats, have a really hard time is connecting to people’s hearts instead of here,” Hirono said, pointing to her head. Hirono is not great with words or thoughts, but what she’s trying to say is that Democrats appeal to voters intellect, but not their emotions, which she believes is how voters must be making their decisions. This is the complete opposite of a true statement since everything Democrats say or do is designed to inflame rage and elicit fear while being completely devoid of facts or practicality. As it turns out, however, this is not the Democrats’ fault but rather the voters who are too simple-minded to understand Democratic Party greatness, according to Hirono. After all, “Democrats know so much” and are “very left brain,” which is a nice way of again telling us how smart they think they are while calling the rest of us too stupid to understand. Did you get that? Let me say it again. Hirono is saying that Democrats are way too smart for the average American voter to understand, and by extension, we are too stupid for our own good. But, the fact that she not only said this out loud for voters to hear but also delivered this line in broken English, bordering on gibberish, proves that Democrats aren’t quite as smart as they think they are. The left side of the brain is associated with analytical thought, but Hirono was using the part of her brain that’s obviously connected to delusions. Her comments may be symptomatic of some serious mental health issues and not a part of a normally functioning brain. Just the fact that Hirono admitted that Democrats held a retreat in which they discussed how smart they are and how dumb we are shows their smug elitist attitudes. When you think you are smarter than other people, you can never make a connection with them. The thing is, this intellectual superiority is all in Democrats’ heads. They think that high taxes and job-killing regulations are what drives a healthy economy. They believe that disarming good people while leaving the criminals armed will make us safer. They believe that killing unborn babies saves lives. Which brings us to the real reason why Democrats have a hard time connecting with many voters. It’s not because people are racist, sexist, or stupid, but rather because Democrats stand for a lot of far-left wackiness that turns people off. Yes, there are plenty of kooks and losers who like what the Democrats have to offer, but there are a lot more who like keeping most of their paycheck and enjoy their personal freedom.